Mars - 4th rock from the Sun - has long held a fascination for Earthlings. More recently, it's been in the news for the past couple of years, what with the closest approach to Earth in August 2003 plus this year’s upcoming repeat this Fall, and the stream of images sent back by NASA's twin Rovers: Spirit and Opportunity. There's no doubt whatsoever that these two Rovers have been an unqualified technical and mechanical success. We're here to establish the existence of standing water on Mars actually! You know ... ocean's, seas, that kind of thing ! What unequivocal evidence do you have to demonstrate the existence of these seas and oceans on Mars ? Well ... err ... none actually - but we're really truly certain that they did exist ! After that performance, Tim would surely have tossed the lot of them over the precipice ! Monty Python aside, my point here is that given the extraordinary resemblance between much of the Martian surface today and modern Earth deserts, NASA needs to maintain a high degree of scientific integrity in pursuing its avowed mantra: "Follow the Water". So, what is NASA doing on Mars ? Well, as it does with the Hubble images, NASA enhances the data. This image of a field of Martian sand dunes is spectacular in true colour, but NASA cannot resist improving on nature. Fair enough: it's only colour and contrast after all, but it doesn't end there ! Spirit was sent to Gusev crater because the smooth crater floor and the valley breaching the crater wall to the SE suggested that Gusev may once have contained a lake of standing water. However, the very first images posted on the web after touchdown clearly showed that something was wrong with this interpretation. Water tends to round large rocks into pebbles as the rocks bang up against each other and get eroded, but there's not a rounded rock in sight here ! Nonetheless, NASA continued to insist that the Gusev crater floor was indeed a lake bed. However, many geologists, upon seeing these images, immediately recognised that these widely spaced angular rocks were either impact ejecta or ventifacts - rocks faceted by the sand blasting action of desert winds. After a few days, NASA admitted that the lake bottom hypothesis was weak, but then claimed that the fine grained sand between the rocks had blown in from a dried up lake bottom somewhere else ! In other words, NASA was going to find evidence for lakes, whatever the geological evidence actually indicated ! A few weeks later , Opportunity landed in a wide open plain on the other side of the planet called Meridiani Planum - and immediately NASA claimed it had found evidence for the deposition of sediments on an ancient sea floor. In what was to become an truly annoying habit, NASA came up with a cute name for what it had found : “Blueberries" - small ball-bearing-like objects made of iron oxide (or rust!). What you see here are iron oxide blueberries eroded out of the rock, as well as those that are still embedded in the rock. Notice how widely spaced apart the embedded ones are ! In the red box, you can also see some wiggles in the rock layers that NASA interpreted as cross-sections through ripples, the kind of thing you can see on any sandy beach on seashores, or shallow sea floors on Earth. NASA immediately identified the iron oxide blueberries as analogous to ooliths that make up limestones that precipitate like pearls from seawater directly onto shallow sea floors here on Earth. The problem with this is that, as any geologist knows, ooliths in limestone are packed together like sardines in a can ... not widely separated as are the Martian blueberries seen here. Apologies : I forget where I found these web images. ... not widely separated as are the Martian blueberries seen here. 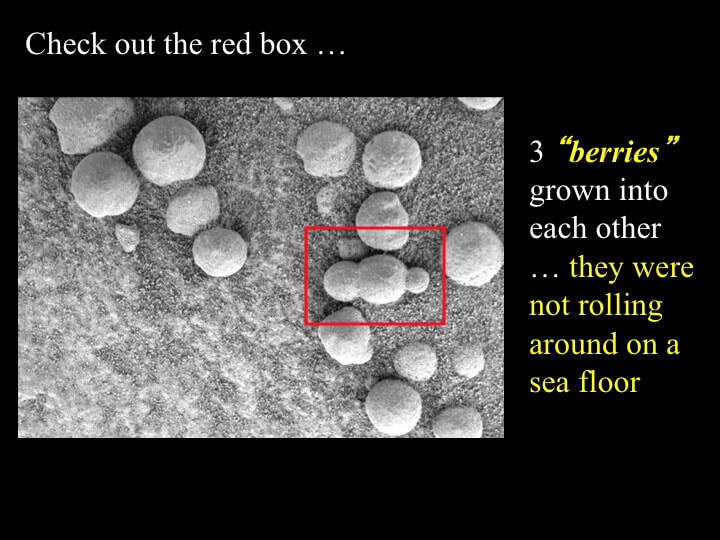 Take a look at the isolated group of three blueberries in the red box here ... they have grown into each other. In other words they didn't form by rolling around and growing on a sea floor the way that ooliths do. Check out this picture : if the blueberries formed by precipitation on a sea floor, then the sediment that contains them now must've buried them after they formed. However, notice how the layering in the sediment does not deflect around the blueberries in the red boxes, especially the one on the left . This means that the blueberries must've overgrown the layering instead! Hence, they formed later than the sediment they are contained in. Enough of blueberries ... what about the rocks themselves ? Sedimentary rocks contain layers that reflect the processes of sedimentation. In other words the way that the stuff they are made of was dropped into the place where they formed. This is the image of Burns Cliff on Mars, and you can easily see that the rock has horizontal layers in it. This is also from Mars. These layers are observed on a flat surface, but the layers themselves are vertical: they have been tipped up on end by geological processes. This is a classical geological feature where the layers to the left are truncated at a clear angle by the layers to the right. This tells us that the layers to the right are younger than the ones they cut. The geological interpretation of this feature is that the older layers (left) represent a cross-section eroded through the steep face of a migrating sand-dune-like feature, while the younger layers (right) represent a cross-section of the gentle back slope of another dune that climbed over the first one (hence "up" and "down"). However, this kind of layering can form due to the action of wind, volcanic explosions - or water - which NASA acknowledges. However, they always put the water hypothesis first ! On Earth, the classical sedimentary evidence for deposition of sediments on a shallow sea floor is the presence of ripples in the sediment that indicate two diametrically opposed directions of current, reflecting incoming and outgoing tides. Ripples are like miniature sand dunes, so a cross-section through two back-to-back ripples would look like a "smiley mouth" with dimples - and sure enough NASA has called what they interpret to be back-to-back ripples on Mars "Smiles". Oooops ! Unfortunately, Mars doesn't have a decent sized Moon so it cannot have any tides ! But that doesn't seem to stop NASA. Can you see the ripples in this image when NASA's interpretation lines are removed ? Can you see anything at all in this unedited original NASA montage? The bottom line here is that NASA is pushing way too hard for a standing water interpretation of these sedimentary structures ... and this is not good science ! NASA has even determined that fractures in rocks are evidence for the presence of standing water on the surface of Mars. Here you see a set of fractures that NASA calls "Razorbacks", and interprets as cracks though which water once flowed. Any geologist will tell you that this is likely true, but the razorback is simply a vein of harder material (quartz?) deposited in the crack that has subsequently resisted erosion. However, the water that deposited the vein mineralisation was flowing at depths of 100's to 1000's of metres below the planetary surface, and it says nothing about the presence or absence of standing surface water ! Although this isn't strictly related to the observations by the Rovers themselves, we can stand NASA's quest for seas and oceans on Mars on its geological head. Seawater on the surface of a planet warm enough for water to be liquid will try to evaporate, and in doing so it will precipitate calcium carbonate (CaCO3) directly onto the sea floor as thick layers of solid limestone. NASA has made a big todo about finding traces of calcium carbonate between the grains of other materials, but is underplaying the fact that they simply haven't found any limestone – anywhere ! - using Rovers or orbiting probes. Sorry, another mea culpa about photo credit here. The commonest rock on Mars is volcanic : it's called basalt and it resembles the stuff that Earth's ocean floors are made of. One of its common minerals is olivine, a mineral well known on Earth. n the presence of abundant water like a sea or ocean, olivine breaks down to something completely different. However, fresh unaltered olivine is very common and very widespread on Mars, as orbiting probes have shown, suggesting widespread dry conditions, at least in the long-term, on the Martian surface. NASA acknowledges this , but underplays its significance with respect to the quest for water. Evaporating seawater in very shallow seas gives rise to two kinds of special chemical sediments : sulphates (e.g. jarosite that NASA has made a big fuss about), but mostly chlorides, such as common salt, which has only been detected as traces on Mars, as this graph shows for 4 different locations. Once again, NASA underplays the significance of this lack of chlorides in its Martian sea or ocean model. Finally, this is an unedited NASA graphic and caption. I really object to NASA blaming us - the public - for suggesting that what looks to me like a mineral filled crack (a veinlet) might be a fossil microbe. This really is playing politics with science and should stop immediately ! Interestingly, just a month or so ago the science journal Nature published a special set of papers summarising the scientific results from the Mars Rovers. The authors of those papers are mostly university based, not NASA staff ! Their conclusions are very similar to what I have presented to you here - that there really is not a firm body of evidence stemming from the Rover mission for the existence of large bodies of standing water in Martian history. So, am I bad-mouthing NASA here ? Well, I guess I am ! There's no denying that they've achieved a great deal in the recent Mars exploration program, and an ancient sea or ocean of standing water may well have existed in early Martian history, as illustrated in this artist's impression. However, the Rovers have not contributed significantly to identifying evidence to support this hypothesis and it's time that NASA stopped mixing science and politics in its Martian exploration program. On top of that. NASA should update its web-based archives to reflect the more recent re-interpretations of the early Rover observations too - such as those published in Nature.